December is one of the cruelest months for Jews. Sure we have Hanukkah to celebrate our urge to shop, and latkes to indulge our genetic urge for carbs, and we can decorate in blue and silver to our hearts’ content, but the one thing we’re lacking in is carols. Let’s face it, other than “Oh Hanukkah,” and Adam Sandler’s “Hanukkah Song,” there aren’t a whole lot of Hanukkah hymns on the airwaves. Rather than kvetch and whine about the lack of Chanukah chants this holiday season, I decided to do something about it. As with all things Jewish and musical, first I turned to my Cantor for inspiration. Cantor baby, slip a table under my knee, for me. I’ve got an ache in my neck, Cantor baby, so hurry the masseuses tonight. Cantor baby, a Jaguar convertible too, teal blue. I’ll wait for you with the bells, and Sven and Nels. Cantor baby, so hurry the masseuses tonight. Cantor baby, I wanna sunny vacation spot, oh yeah. And really that’s not a lot, been an angel all year. Cantor honey, there’s one thing that I really do need, a maid, who can cook matzo ball soup, doo doop. And clean up after my kid, which is a pain in my neck. So hurry the masseuses-I’m not talkin’ mezuzahs-hurry the masseuses tonight. My own family did not inspire this next little ditty, I swear. Oh the fight we had last month was frightful. But hashing it over is so delightful. It’s finally time to end the row. And I’ve bought some corn for popping. So much for family drama. Can you just let it go, mama. My last nerve is about to blow. When we finally kiss goodnight. How I’ll hate going home if you’re mad. But what’s a holiday if there’s not a fight. It’s what we call communication. And venting our seasonal frustration. My family didn’t inspire that last one, but this one sure brings back memories. Of course all of the snow at my Grandmother’s house in Beverly Hills was fake and came from Niemans. Noshing through the snow, in a big safe Grand Marquis. O’er the roads we go. Bells on cell phones ring. Dad thinks of the gelt. What fun it is to laugh and sing and watch the chocolate coins melt. Oh, Grandma Kvells, Grandma Kvells. Oh, what fun it is to ride in a family car all day, hey. Oh, what fun it is to ride in the family car all day. We wish you a Merry Mazeltov. We wish you a Merry Mazeltov and a Happy New Year. Good tidings we bring and a hot brisket too. Good tidings for Hanukkah and some pastrami too. Oh, bring us some lox and bagels. Oh, bring us a smidge more kugel. Oh, bring us some Matzo Ball Soup and a cup of Manischewitz. We won’t go until we get full. We won’t go until we get full, so bring some more food! 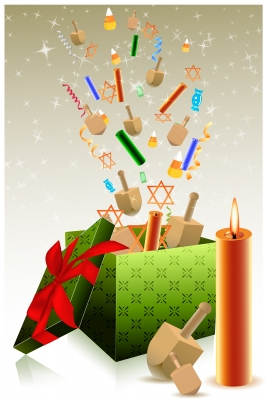 Merry Mazeltov to all of you. Send your Hanukkah hymn suggestions to Leslie@LeslieDinaberg.com . Originally appeared in the Santa Barbara Daily Sound on December 8, 2012.